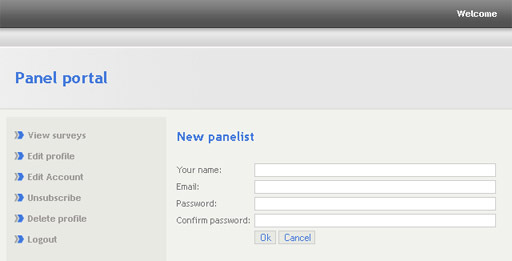 The panelist enters required information on the "New panelist" page in the panel portal. Panelist name, email and password are required. The panelist receives verification email with the link to the panelist portal. When the panelist clicks on the link included in the email, the email address is verified and panelist can proceed with the profile form. The panelist is not required to fill out the form. Some or even all panel attributes may remain unanswered.